Please make sure to read recipe notes before starting! 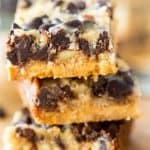 These Paleo and vegan friendly magic cookie bars are a healthier remake of the classic dessert! You'll never know they're gluten, grain, dairy and refined sugar free! In a large pot, set over high heat, whisk together the can of coconut milk and 1/2 cup of Honey (or agave), reserving the remaining honey for later. Bring the mixture to a boil and boil for 1 minute, stirring constantly. Then, turn the heat down to medium and and simmer for 20 minutes, stirring frequently, until the sauce reduced by about half. Transfer the sauce to a large measuring cup to cool while you make the crust. Note: You should have about 1 1/4 cups of sauce left after cooking it. Once you've made the sauce, heat your oven to 350 degrees and line an 8x8 inch pan with parchment paper, spraying the sides generously with coconut oil spray. Note: It helps to spray the bottom of the pan before putting in the parchment paper, to secure it. In a large bowl, using an electric hand mixer, beat the remaining 3 Tbsp of honey with the coconut oil until smooth and creamy. Stir in the flour and pinch of salt until a wet dough forms. Press the dough evenly into the bottom of the pan. This will be a little bit tough, just be patient with it. I found it easiest to use the palms of my hands, and rinse them off every so often, until the dough was pressed in. As soon as the crust comes out of the often, sprinkle the chopped nuts on top, and lightly press them into the crust. Then, sprinkle on the chocolate chips evenly, followed by the coconut flakes. Pour 1 Cup of the slightly cooled coconut milk mixture (you'll have a little left over, but you don't need to use it all for these bars) EVENLY over the top of the surface. Then, gently shake the pan around until the coconut milk mixture begins to sink between the layers. * The coconut flour I usually use needed 3/4 cup, but I also tried it with a different brand and 66g was only 1/2 cup + 1 Tbsp. So, PLEASE weigh your flour first before trying to make the crust. ** You NEED to let these sit overnight to make sure the coconut milk really has a chance to chill and thicken.